The process of manufacturing the Printed Circuit Board laminate is handled by subcontractors. It is messy, time consuming, needs hundreds of square meters of space and few companies integrate it into their manufacturing process. It is a very interesting process to watch (well, if you enjoy visiting factories...) - we have some photos of an older PCB manufacturing plant. We outline the steps in the process below. We buy some PCBs in Australia, and have some PCBs made offshore. Whichever country you live in, it is likely that there are still local PCB manufacturers. Here in Australia most of the manufacturers send at least some of their work overseas - and many local companies are nothing but sales agents for China boards. If you have a local manufacturer, (vs the Sales agents) you should support them - they will provide you with a good service when the chips are down, so to speak. Perhaps economic pressure will mean some of your work needs to go offshore - but not all of it. 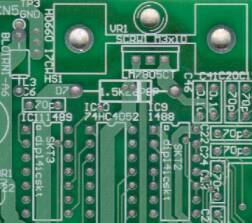 PCB manufacture is very competitive in Asia, and prices will be lower compared with local product. However, there is a substantial cost involved in installing and servicing any electronics device that is many times higher than the cost of making the original PCB laminate. In practice, there is always room in the final product price, of atleast some of a companies products, to support your local manufacturers. The PTH Printed Circuit board manufacturing process. The drilled laminates are coated in a chemical to enhance electroplating of holes. This is usually done using a multistep process called electroless copper. The laminates are put in a copper plating bath, all the holes are electroplated. This connects pads on opposite sides of the PCB, electrically, through copper in each hole. The future - 3D printing? An idea put forward recently is that PCB manufacture will be replaced by 3D printing. My opinion is that the scale of the task is wrong for this to happen in the near future. Right now the price of PCB manufacture for double sided work (offshore) is trending towards about $80 per square metre even in moderately small volumes. That is for a circuit board that has geometries of 8mil x 8 mil or less, thousands of holes, thru-hole vias, routing, soldermask, overlay. We saw the advent of robotic assembly for surface mount (pick and place), but it is my opinion that traditional plate and etch lines will stay the standard production method for PCBs for some time to come - with the exposure and screen print steps becoming more automated - and so, more flexible. As a side note I would add that existing PCB milling is an alternative way to produce prototypes, although without PTH holes, and it is on the same individual scale as 3D printing - giving it a certain adventurous appeal.